Main ApplicationsFor base boards, window sills, door and window frames etc. 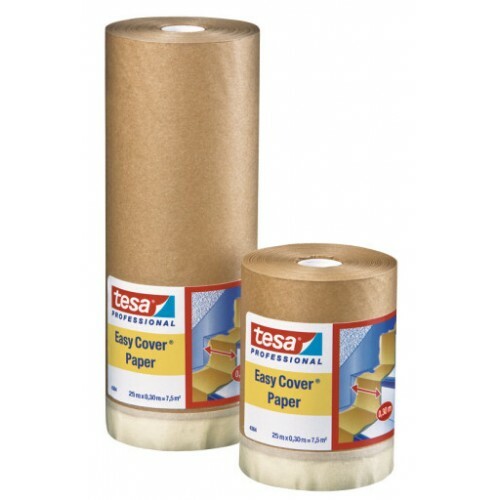 Product FeaturesEasy Cover¨ 4364 is a combination of high quality folded special paper and a slightly creped adhesive paper tape for the masking of large areas in one working step. It is resistant to water-based paints and can easily be removed after short term applications without residues. Easy Cover 4364 has been successfully tested for all standard indoor applications. It allows safe and precise fixing on even surfaces such as skirting boards, window sills, window and door frames. The embossed film avoids paint bleeding or leaking to the protected area. Easy Cover 4364 achieves a clean paint result with straight paint edges.